Learn how to design any promotional piece and increase response! 176-pages designed and illustrated with 126 newsletter samples + 40 additional project pieces. Know what elements get placed where  and why! By Sheryl Roush.. This book is the course book for the design classes at the University of Ottawa, Canada. "I want you to know how very impressed I am with how you put this together. I think it looks absolutely fantastic and I'm excited to go through it. Coming from a print background for 10 years, we used to put on free newsletter classes for our clients and prospects and did a lot of newsletter publications. This is such a terrific piece of work." "My association and personal friendship to Sheryl Roush is an additional blessing in my life, nevertheless her inspiration, love and professionalism not only touches my life but that of countless human beings. 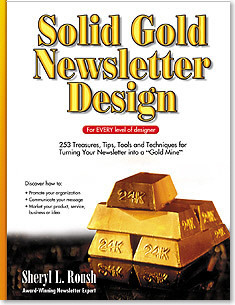 Her unparalleled experience as a graphic artist and multifaceted individual, makes 'Solid Gold Newsletter Design' a guide brimming with techniques and tips that will make your next newsletter a solid gold winner! Her methods are specific, proven and very easy to apply. You will simply FALL IN LOVE with her book!" "Great tricks and hints like dingbats, pull quotes and drop caps are the smallest things we can do to greater improve the layout." "The psychology of my market -- and what part of the page is viewed first is quite valuable -- the three stages of displaying informational visually." "I have my new brochure and it sure looks a lot better than the old one, thanks to you. Also, found a format for my newsletter so it looks a lot more professional. You sure got me inspired!"